Laminate flooring subfloor type and it’s proper preparation should be at the top of your to-do list when installing a new laminate floor. Failure to properly prepare a laminate flooring subfloor results in a large percentage of laminate flooring failures. When investing in a new floating laminate floor make sure it is installed properly to assure that the new flooring will not only look great but also perform great. Here are few laminated flooring subfloor preparation tips that will help to prevent a floor failure. When purchasing laminate flooring, always obtain and read the installation instructions for the floor you are purchasing. Not all laminate manufacturers have the same laminate flooring subfloor requirements. Most but not all laminate floor manufacturers require a subfloor to be flat within 3/16″ over a 10 foot radius. Other manufacturers will have a different requirement though flat and level is a common requirement within the laminate flooring industry. Some manufacturers instructions will use the word level instead of flat, read between the lines as they are usually speaking of the laminate flooring subfloor being free of high or low spots. A subfloor that does not meet the laminate manufacturers installation requirements must be leveled by sanding or filled with an approved floor patching material. 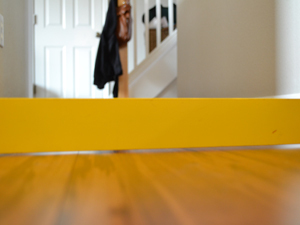 On a floating floor gaps can easily develop between planks when a subfloor is not level. Unfortunately as flooring inspectors we see many installations where the person installing the floor claimed to be an expert but did not install the floor as required by the manufacturer. Failing to follow the manufacturers installation instructions is a huge laminate floor problem as it often voids the warranty. Perform a mat test to check for moisture. If any indication of a high moisture content perform a calcium chloride test. Moisture content should not exceed 2.5% on a dry weight basis or the floor may fail. New concrete needs to cure for a minimum of 60 days. Use an approved vapor barrier. Most companies require a vapor barrier even when the floor is covered by vinyl, linoleum, tile or sheet flooring. Grind down high areas or us a self leveling filler to fill low areas. Test for moisture content and make sure it is no higher than the laminate manufacturers requirements. Make sure that the subfloor you are going to install your laminate over is flat and level within the laminate manufacturers requirements. If you have movement in the subfloor correct it before installing your laminate. A laminate flooring subfloor is difficult to correct once the laminate has been installed. Check your crawlspace. Make sure you have a proper vapor retarder covering the entire area of soil in the crawlspace. Check for standing water or wet soil. If you have standing water or wet soil this presents a future laminate problem. Use the proper cushion between the laminate and the subfloor but do not use a vapor barrier over a wood underlayment. Usually make a good laminate flooring subfloor if they are clean and level. Removal of ceramic and stone is generally not required. A good laminate flooring subfloor. The floor must be flat within the laminate manufacturers requirements. A vapor barrier will likely be required, especially if the tile is over concrete. Carpet that is installed over a cushion will not work as a laminate flooring subfloor. Some laminate flooring manufacturers may allow you to install your laminate flooring over a tight, thin, glue down carpet. If you use one that is not thin enough it will feel like you put laminate flooring over area rugs. You will also need to check with the manufacturer of the laminate flooring product to determine if the glue down carpet will be accepted as a laminate flooring subfloor. While these tips are basic, if you follow these laminated flooring installation tips, you may just save yourself a future laminate floor failure. I have a friend that has recently installed a floating laminate floor throughout his house. The house is built on a slab and he used a vapor barrier for concrete installation. The laminate construction included a foam base integrated into each slat. Upon completion of the install, he experienced a localized area of oil canning, likely from the concrete floor being uneven. Is it possible to correct this localized “void” without pulling up the whole floor and leveling the concrete? I don’t know if there is something that could be injected between the laminate and the vapor barrier to fill the void? Any assistance would be appreciated. Thank you! If you are using the term “oil canning to describe a wavy or uneven appearance or distortion in the installed floor there could be a number of causes. This may be a perceived appearance caused by lighting or an actual distortion caused by an uneven floor or even expansion of the floor. The first thing you need to do is determine if the problem is real or perceived and then you can look at a potential correction. As far as injecting a product if you could find such a product, this could cause additional problems if the flooring suddenly adhered to the underlayment or concrete as a floating floor must be able to move. If the problem is the slab the proper way to correct is to remove the laminate and either grind or float the concrete depending if high or low. Good luck and if others have a suggestion please be sure to offer it. Can i save wood laminate flooring that oil canning and bowing up in numerous areas? You are using the term “oil canning”waviness across the flat areas of the board and “bowing” a warp along the length of the board and ask if you can save it? While the short answer to can you save it? would be “unlikely”, there is a possibility you may be able to save it. First you need to determine why it has occurred. A few of the many things that need to be determined are: Is the laminate installed over concrete or wood? Is the subfloor flat? Is the relative humidity controlled? Is there proper expansion around all fixed objects? Is there a maintenance or other site related concern? We’ve had a Pergo laminate floor installed over a concrete sub floor. The problem is that there are many areas where there is deflection on the floor even though the sub floor levels are within the 3/16 tolerance required by the manufacture. The installer came back and took up half the floor and expanded the openings around the wall to ensure tolerance was corrent and leveled two spots which did improve the worst sections. We are told that taking up the floor and doing a complete leveling is both expensive and will not solve our problem. They indiate this is normal for floating floors. While I understand the concept of a floating floor I find it hard to believe that many areas of deflection (feel the floor compress and return) are acceptable. Other floors we have are hardwood glued to concrete and engineered nailed to a plywood subfloor with no problems. Sorry for the delay in getting back to you. You say this is concrete. Did the installer or you do acceptable testing of the concrete? If moisture emissions is too high it alone will make the floor swell and you can expect movement. You say that he came back added expansion space and this helped. If a laminate floor is locked in and expansion space is added it can take days, weeks or even months for the floor to settled down again. Do you know that the cushion under the laminate is properly spread or is it an attached cushion? If it is a separate cushion that is not properly spread or the wrong type of cushion such as one without the proper vapor retarder for use over concrete this can present a problem. As you can see the flatness you refer to can be a problem with laminate floor but not the only cause of deflection. If this is for a short term install the lighter laminate will work out fine. The cushion you select to install it over will have more of a bearing on the sound than the thickness. If you are looking for several years of good performance go with the heavier laminate even though your initial investment will be a bit more. We are installing Golden Select ash laminate with a attached foam backing. The house is built over a crawl space (gravelfloor) which never goes below 58f. The previous owners had commercial carpet glued to the plywood subfloor. Upon lifting the carpet which really just pulled up we have the glue to deal with. After 12 years the glue is still slightly tacky but even through out. You can actually still see and feel the trowel lines. Should we strip the glue or can we put an additional foam liner down before laying the laminate. If stripping is recommended what is the best way to go about it. Since we are living in the house we are doing it room by room and section by section in the larger rooms due to have to move furniture around. I do not recommend an extra layer of foam unless your manufacturer approves of it. Glue can be scraped or just exposing the glue to the air for several day will usually dry it to the point where it is no longer tacky. Does cupping on a laminate floor come from moisture on top or moisture underneath? Or both? I have a customer who put a large amount of water on top to clean but there were also moisture issues on the subfloor within tolerance. But they also had ACT tile so we could not get to the concrete but had to encapsulate the ACT then used a moisture barrier pad. Stacey, Cupping of a laminate floor is caused by a moisture differential within the flooring. While it is usually excessive moisture from the underside it can also be caused by moisture from the surface such as mopping, excessively high humidity and pluming leaks. There is also dry cupping occurring with low humidity. Dry cupping is usually associated with engineered flooring products.